LIVE REPORT: The Parade of Jikken Baby Mellow @ Shinjuku Ruido K4 | VKH Press – J-Rock & Visual Kei Coverage Worldwide! In the first event of it’s kind, 3 bands with their own unique sound joined together for a collaborative event. 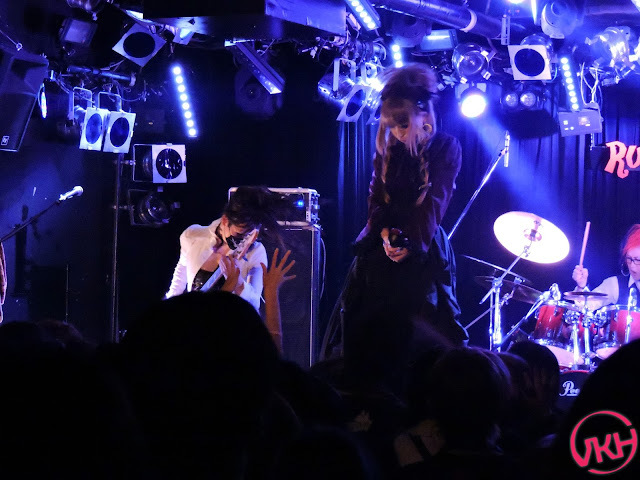 Jazz/Rock band Jikkendai Marmot (実験台モルモット), Visual Kei band Baby Doll Symphony and Gothic-fantasy unit Hollow Mellow performed at "The Parade of Jikken Baby Mellow" on May 21st at Shinjuku Ruido K4. First to take the stage was Jikkendai Marmot, a five member unit consisting of vocalist Tani Takuma (谷 琢磨) , violinist Tagaya Ju (多ヶ谷 樹), guitarist Tokutake Yoshihiro (徳武 宜浩), drummer Junichi (淳一) and keyboardist AiAi (あいあい). The band considers themselves a “passionate colored Ballad rock band” and their performing style certainly displayed that. The show was set to start at 6pm and right on time, the curtains opened with all of the band (sans vocalist) already positioned on stage. They began by playing “アンテベート(Antebeto)”, a purely instrumental piece with a whimsical tune. The song is meant to welcome you into the band’s own world and the audience happily obliged, swayed along to the catchy tune. 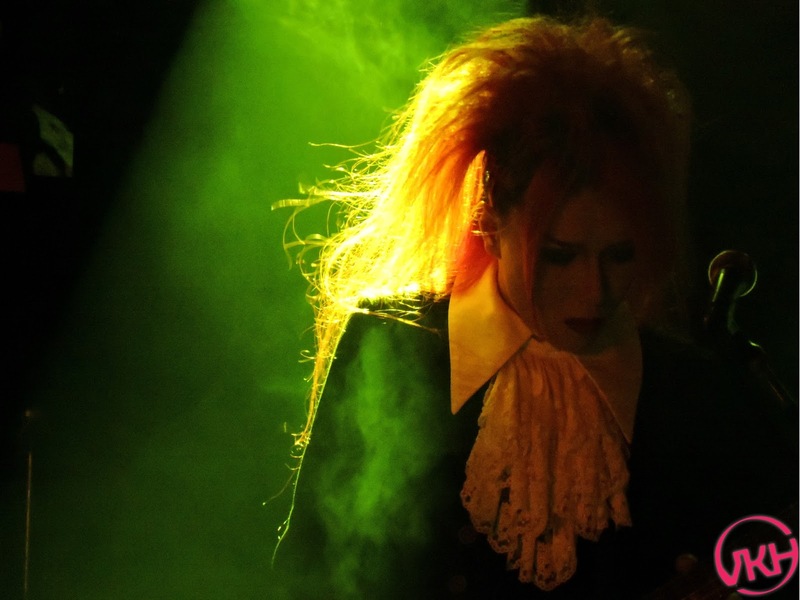 Vocalist Tani Takuma didn’t appear until the end of the instrumental when the stage went dark. 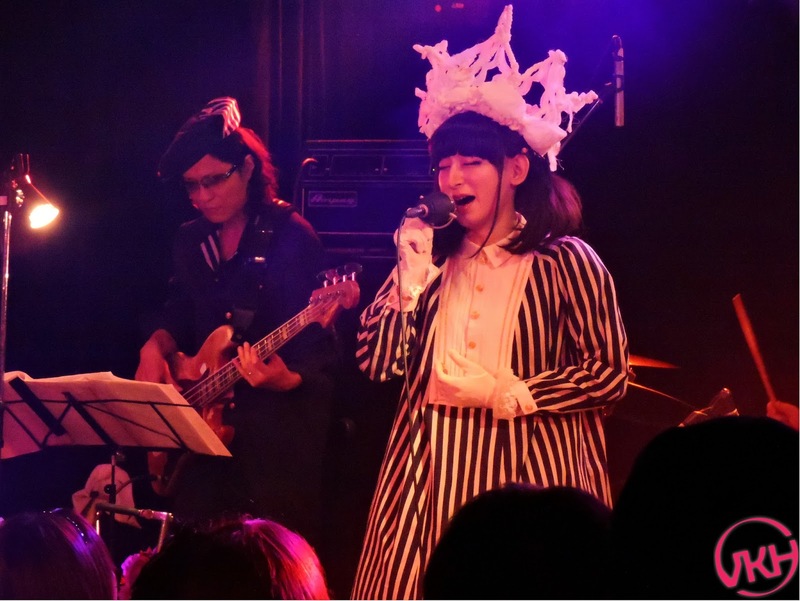 Keyboardist AiAi started the next song “剥片 (Hakuhen)” which featured a jazzy piano opening as well as a strong baseline and punchy guitar and violin riffs. Standing in the spotlight wearing an overflowing bell-shaped gown like a delicate doll, Tani Takuma took center stage and immediately charmed the crowd with the contrast of his fragile appearance and his strong operatic voice. 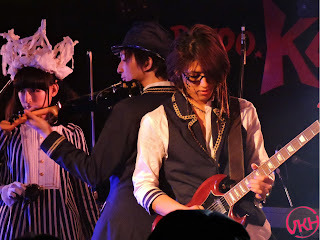 At the end of the song the band paused for a moment for Tani Takuma to shyly greet the audience with a whispered “Good evening”, then they immediately moved to the next number. The next song “キルカサ(Calcutta)” brought down the pace and began with a slow piano intro followed by a distorted violin solo which traveled through the live house as the audience quietly listened. None of the band members moved around the stage much and it was clear that all their energy was being thrown into their meticulous playing. The audience remained enthralled as they played another song “ジアスターゼの鞄 (Diastase no Kaban) immediately after, this time riddled with rich melodies reminiscent of a fantasy. 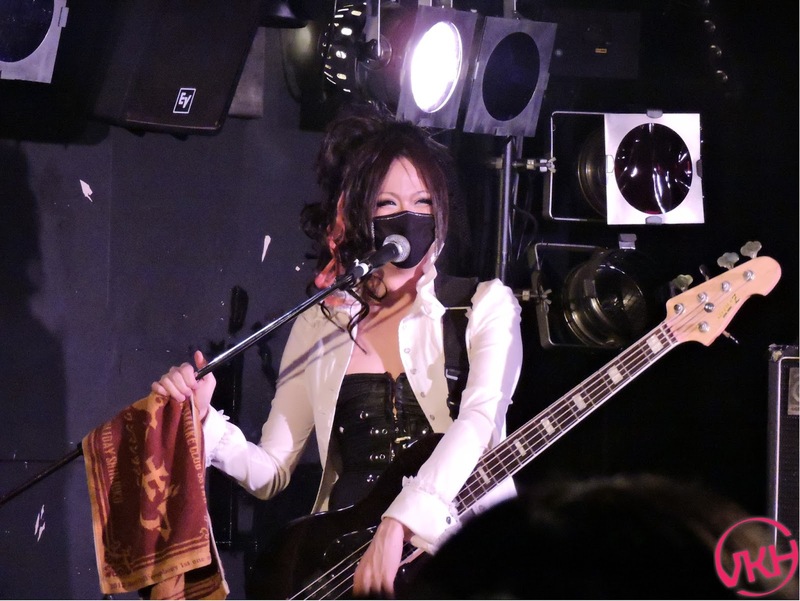 At the end of the song there a longer pause for MC and Tani Takuma introduced some of the band’s new merchandise including items from band's own fashion brand were on sale at the venue. Then he announced that since there was time, he was going to do a special song with just AiAi entitled “小さな虫(Chiisana Mushi)”. 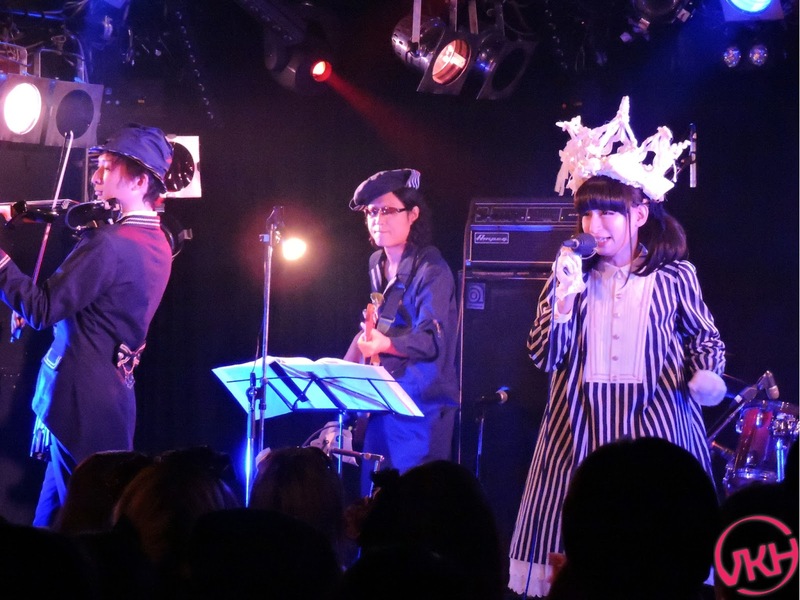 What followed was a melodic blend of AiAi’s graceful piano playing and Tani Takuma’s angelic voice. With no other instruments, the two musicians held the audience captive with the slow, gentle melody of the song. Illuminated under a single spotlight, the crowd experienced the full range of Tani Takuma’s vocals which carried his emotions into the song creating a powerful performance. The audience could do no more than applaud in full appreciation at the end and the members re-entered the stage. There was another MC where they announced their new releases for June and July as well as the sale of their album which would go on sale later in the year. For the next song “病猫タナトフォビア (Yamai Neko Thanatophobia), they needed the audience’s participation. More specifically, they needed the audience to insert adorable cat noises during certain parts. The song was cute and upbeat and the audience played along, having fun and dancing along. 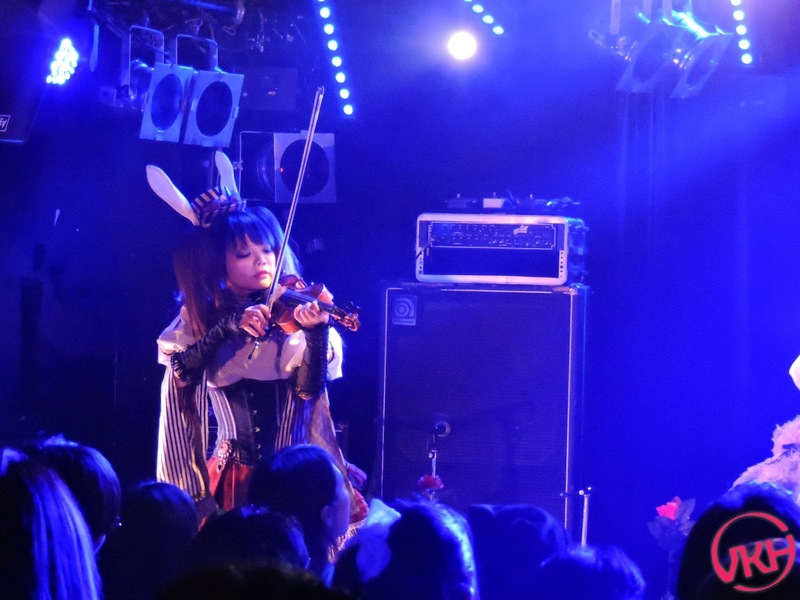 Quickly moving into “ザラメヲリヅル (Zarame Orizuru)”, the song featured a spritely violin intro that kept the pace lively and the audience dancing. During the final MC Tani Takuma talked about how he wanted to become friends with the other band members. Particularly Tissue Hime (ティッシュ姫), the bassist of Baby Doll Symphony and a fellow male to female crossdresser who is quite popular. The last two songs were “ピカピカのバッジ (Pika Pika no Badge) where Tani Takuma hit a spectacular, lasting high note that had the audience enthralled. The last song “Nakano no Machi ni Ame ga furu (中野ノ街ニ雨ガ降ル)” began with a mid-paced jazzy drum riff and was interspersed with violin and guitar solos. The song ended which each member giving a short solo display of their musical skills and they left the stage to a solid round of applause. Despite only performing for an hour, Jikkendai Marmot showcased their amazing skills both in musical technique and vocals. 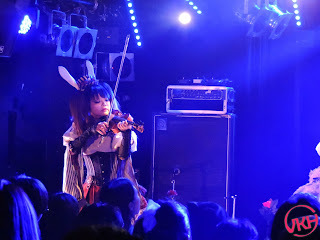 Tani Takuma was adorable and perfectly suited to the cute and whimsical, yet dark nature of the music. 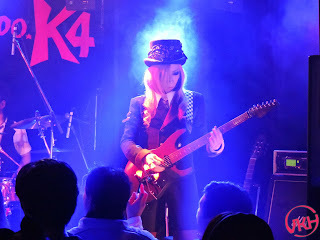 The blend of instruments created music that blended solid rock sound with a fantasy feel and the vocals gave it the final unique touch making Jikkendai Marmot an exceptional live experience. Next up was Visual Kei band Baby Doll Symphony with Rino (りの) on vocals, guitarist Yuto (ゆうと), bassist Kokumaru Milk a.k.a Tissue Hime (ティッシュ姫) and drummer Mitsuru (みつる). "We will show you the real hell". The curtain opened and without wasting a second, the band threw their full energy into their performance. From the first song “魔女狩りの夜に (Majogari no Yoru ni)”, it was clear that Baby Doll Symphony meant to drag you along for a crazy ride. 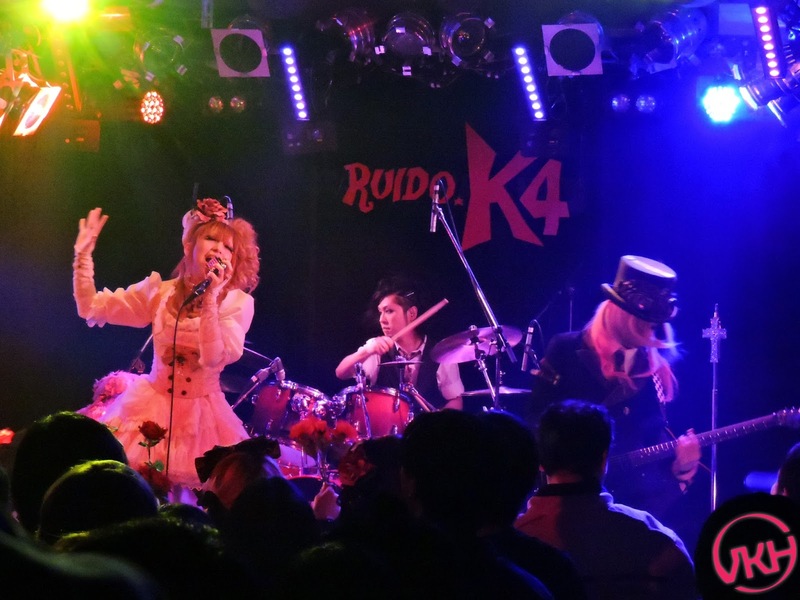 With the song’s fast paced drum beats, speedy guitar riffs and the rich tone of Rino’s vocals, it took them no time at all to sweep the crowd into their aura and have them raring to go. 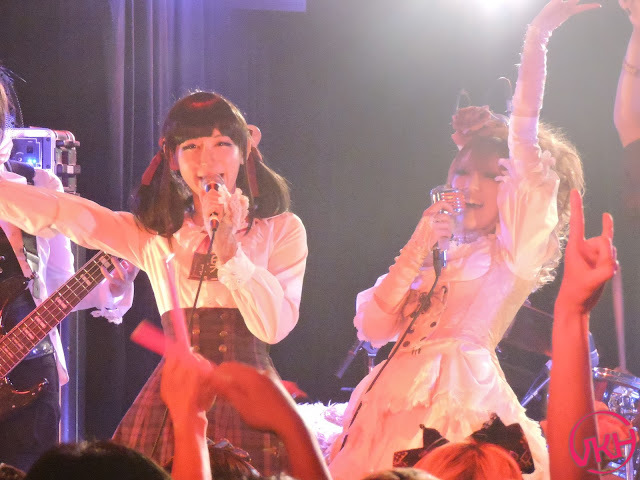 They immediately transitioned into the next song “残響のメロディ (Zankyou no MELODY) continuing to showcase their fast-paced and energetic performing style. The band finally paused for breath and bassist Tissue Hime did the MC. He mentioned Tani Takuma’s earlier statement about wanting to be friends and commented on how cute he was, much to the delight of the audience. Tissue Hime introduced each of the band members and asked the crowd if there were enjoying “Jikken Baby Mellow”, to which the crowd responded with positive enthusiasm. He talked more about the other bands giving the overall impression that they all got along well. He asked the crowd to please enjoy the show till the end and they moved into the next number. 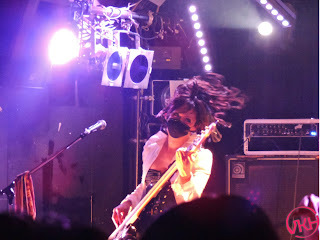 Without pausing they played “博士と彼女と秘密の実験室” which kept the energy in the venue high as most of the audience clapped and danced along. 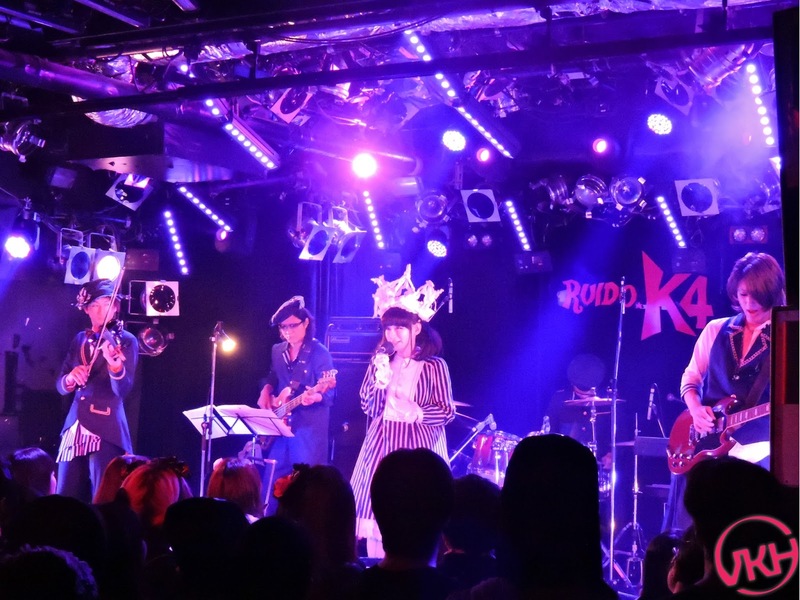 Rino announced the next song “ラリリカメリィゴーランド (Lalilika Merry-go-round)”by telling the audience “tonight let’s ladidadi” which was followed by a bouncy intro and a call and response that had the crowd chanting “ladi dadi”. The audience members all produced towels seemingly out of nowhere and began waving them around while energetically dancing. Despite not slowing the pace down since the beginning of their set, Baby Doll Symphony kept the crowd up to pace with their powerhouse performance. It was evident in the loud cheers at the end of the song and without even a pause for breath, they moved on to the next number “Dancing Dizzy”. True to it’s name, all the members were jumping around on stage, inciting the crowd to jump as well. The crowd cheered enthusiastically at the end and there was finally a pause. Even so, the energy that the band brought into their performances showed in their MC as well. Tissue Hime jokingly pointed out that that "That was exercise right? Let me drink a little water!". They talked about Jikkendai Marmot’s previous performance a bit more, playfully making fun of the cute, cat-themed call and response that Tani Takuma did with the crowd. They also announced the release of their second love DVD, exclaiming loudly that "IT’S ON SALE TODAY!!!". With the audience already pumped up, they moved to their next number “首斬りクイーン (Kubikiri queen) which opened with a relentless drum beat, thrash guitar and bass riffs, prompting the crowd into crazy head banging. Rino’s vocal range was on great display; rich and smooth during the slower parts then switching effortlessly into screaming when the song got frenzied. The crowd gave their full participation, chanting along with the other members and pumping their fists in the air during Yuto’s guitar solo. When they called for the last song, “惨劇アリス (Sangeki Alice)”, the energy in the venue was electric and lasted well past the fall of the curtains. The band had a solid heavy metal sound overall which combined pop, gothic and jazz influences allowing them to perform a fun, fast-paced setlist. The members had great interaction which made the performance and the MC more enjoyable and the crowd got more and more excited as the set continued. All the members had good stage presences and delivered a fully enjoyable show. 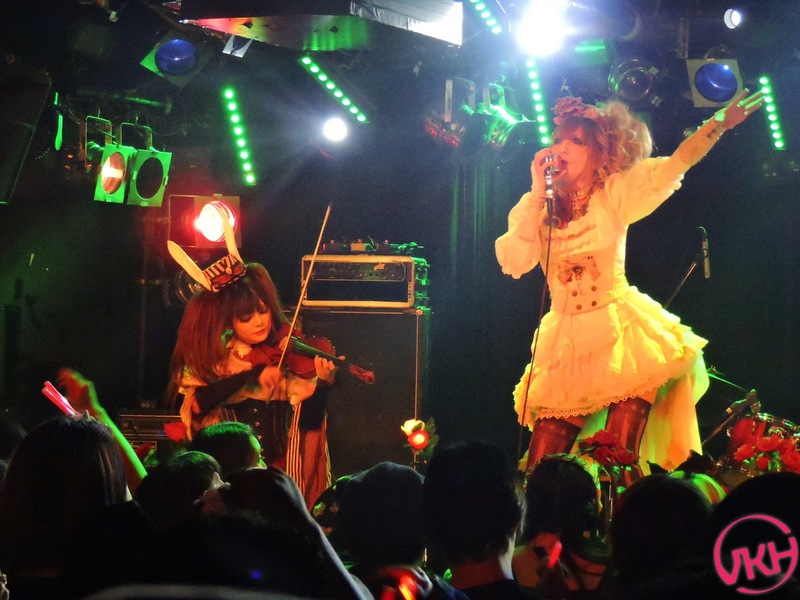 The last act to take the stage was Hollow Mellow, a 3-piece unit consisting of Iruma Rioka on vocals, Jill on violins and Nemu on guitar. Before the curtain was raised, the soundtrack of BeetleJuice and Edward Scissorhands drifted through the speakers, creating a creepy yet nostalgic atmosphere. The curtain went up at 8:15, with all of the members positioned on stage. They were all dressed in elaborate, gothic costumes, a trademark of Hollow Mellow’s style with violinist Jill sporting cute bunny ears. The first song “Romantique” brought the crowd back to life, drawing them into Hollow Mellow’s fantastical world as the lyrics invited them to dance along to its catchy beats and mesmerising violin. 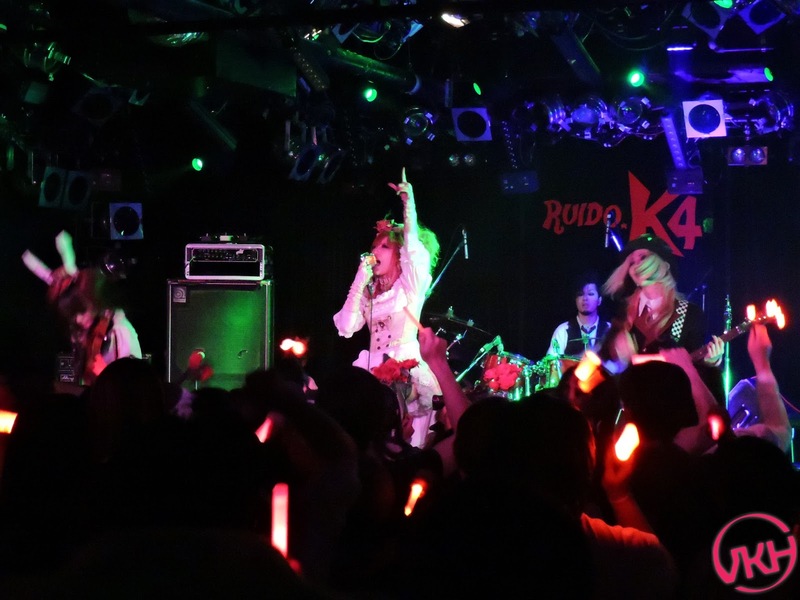 Moving right into the next number “Bad End -Snow White-”, the audience members began waving red roses and red-colored glowstick to show their support to the members. The song blended dark lyrics with an upbeat melody and Iruma charmed the crowd by dancing adorably to the music. At the end, there was a short MC where the members were introduced and Iruma told the crowd that Hollow Mellow wanted to show them a fantasy world. After the MC, the next song was “塔からの手紙 -Letter- (tou kara no tegami -letter-)” The spotlight was on Nemu who played the song’s soft acoustic opening. 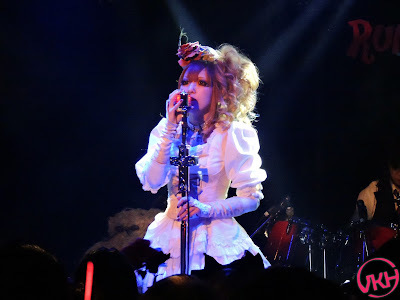 Iruma Rioka in her white gown was illuminated softly by the light, resembling an angel on stage. While singing, she daintily plucks a rose from a fan and waves it through the air like a magic wand. The song picked up the pace and featured a solo from Jill before it ended in an array of dazzling disco-esque lights. In “Just one more dance -Cinderella-” Iruma Rioka announced that she would like to tell Cinderella’s story. Although the song was slow-paced, it was the most dramatic performance so far. 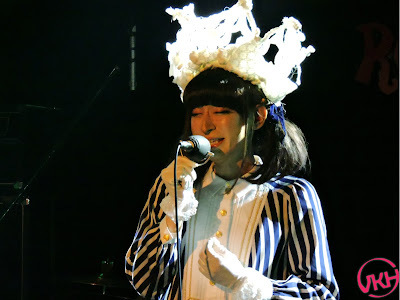 Iruma Rioka showcased her vocal range and emotional singing skills. 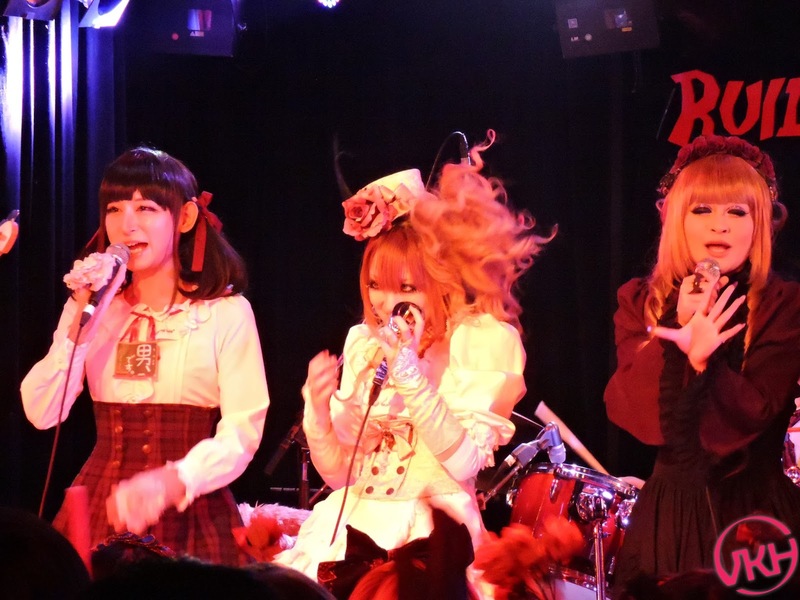 They moved immediately to the next song “Eat Me -Little Red Riding Hood-”, a song with a haunting melody accompanied by strong guitar riffs that gave the venue an emotionally charged atmosphere. After that there was another pause for a chat with the crowd. 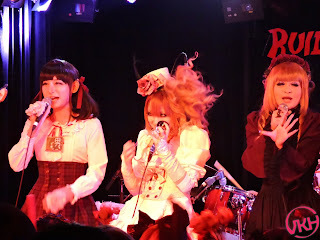 Nemu asked if everyone was enjoying “Jikken Baby Mellow” and the crowd heartily agreed. He said that they chose the bands that they really wanted to play together with. At this point Iruma Rioka had sat down and was sharing a seat with the giant teddy bear named Honey who often pops up in Hollow Mellow’s videos, seemingly caught up in their own world. After this, they shared a special announcement with the fans that they were going to have their first anime song debut. Their newest song “覚醒之夜(Kakusei no Yoru/Juéxǐng zhī yè)” was going to be used for a Chinese web anime. Even better, they were going to film the PV for the new song right then and there. They began to hand out glowsticks, urging the crowd to take and share. Jill and Nemu helped with the distribution and Jill amused everyone by throwing glow sticks to the people at the back and (luckily) not hitting anyone in the face. The video would possibly be uploaded to Youtube or shared via the Hollow Mellow Line account. After they made sure that everyone was ready, they began the new song which was upbeat and energetic, getting everyone to wave their glowsticks in time. They performed only a short portion of the song before the cameraman needed to change locations. While everyone was waiting, Jill took the opportunity to show off her fluffy bunny ears to which everyone screamed “ADORABLE”. Nemu jokingly copied her, much to everyone’s amusement. The song was filmed from a couple more angles before the cameraman was satisfied and they ended the shoot with a huge round of applause for everyone’s participation and energy. As a reward to the audience for their enthusiasm, Hollow Mellow gathered at center stage and gave everyone the chance to take photos freely. 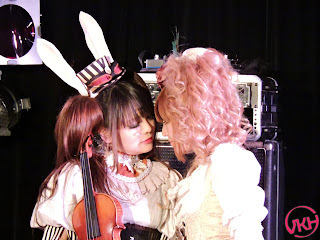 Jill and Iruma Rioka crowded together, posing like dolls and even sharing a quick kiss, throwing the audience into a frenzy. After the antics of before, “Asterisk” had more of a serious tone. Iruma Rioka remained positioned at center stage in front of her elaborate mic stand. 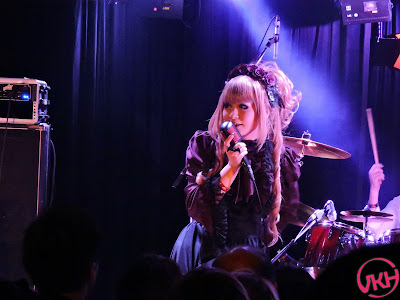 There was a definite melancholic atmosphere and Iruma Rioka’s vocals shone through amazingly during the performance leaving the crowd in awe. Just before the last song, they mentioned their September one man live once again as well as a birthday live, a live in Nagoya in August and soon, their first live in America. The final song entitled “暁のヴァンパイア (akatsuki no vampire)” was a new song and was delivered from the perspective of vampire singing to the human who betrayed him. Despite the melancholic lyrics, the melody itself was upbeat and the entire performance ended on a lively note. Amidst the cheers of the crowd, they announced that they would now have a special session with the other two bands. Everyone returned to the stage, exciting the audience with the variety of personalities and costumes. They all chatted for a while and the girls (and guys dressed like girls) complimented each other on their cute outfits and amazing performances. Tani Takuma of Jikkendai Marmot wore an amusing button with the words “I am a man” printed on them while he and Tissue Hime discussed their new friendship. Then it was time for the special performance which was none other than “紅蓮の弓矢 (Guren no Yumiya), the first opening song from the Shingeki no Kyojin/Attack on Titan anime and a huge fan favorite. Despite being a little crowded on the stage, everyone went all out and the fans fully enjoyed themselves singing along to the popular song. Clearly a great way to end the night’s show. Keep an eye on our official Flickr page for more pictures from this amazing live! Many thanks to Hollow Mellow, Baby Doll Symphony and Jikkendai Marmot for this opportunity!